This Week’s Question: What Is a Supermoon and Just How Super Is It? The full Moon on Dec. 3 will be the first and only supermoon of 2017. It will be followed by two more in January and February 2018. Learn about supermoons and find resources to get students excited about exploring Earth’s only natural satellite. For more Moon lessons from JPL Education, visit https://www.jpl.nasa.gov/edu/teach/tag/search/Earth%27s+Moon. To learn more about the Moon, visit https://moon.nasa.gov/. Explore the lunar surface with Moon Trek. Check it out at https://moontrek.jpl.nasa.gov/. Are you interested in discovering new facts about our universe? Do you like looking at cool pictures of the cosmos? Check out the Astronomy Picture of the Day website! Each day, a different image or photograph of our fascinating universe is featured, along with a brief explanation written by a professional astronomer. Visit the site to submit ideas and to vote on names currently under consideration. Submissions and voting closes at 3 p.m. EST/noon PST on Dec. 1, 2017. NASA and the New Horizons team will announce the winning nickname in January. For more information, visit http://pluto.jhuapl.edu/News-Center/News-Article.php?page=20171106. Entries are due Nov. 30, 2017. For more information, visit http://BigIdea.nianet.org. This Week’s Question: What’s That Space Object? 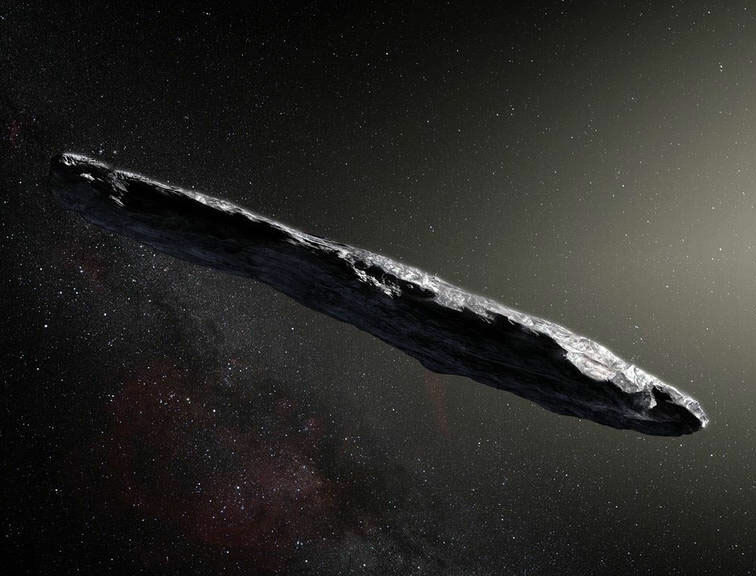 Space scientists around the world are getting excited about this cigar-shaped space object! Click the link to find out what makes the unique object so special. Go on a tour of our galactic neighborhood with the new science podcast from NASA! “Gravity Assist” is a 10-part series featuring lively conversations with some of the world’s leading scientists. Listen in weekly to learn more about our solar system. This Week’s Question: What Is Antarctica? Antarctica is the coldest place on Earth. Find out who lives there and what NASA can learn about our planet by studying this place at the bottom of the world. A new NASA study adds evidence that a geothermal heat source lies deep below Antarctica’s Marie Byrd Land. This discovery explains some of the melting that creates lakes and rivers under the ice sheet. Read Hot News From the Antarctic Underground to learn more about the latest findings. Four years from now, NASA and its Jet Propulsion Laboratory will once again rove the Red Planet with Mars 2020. This time, mission objectives include exploration of extremely ancient habitats to enable collection of samples that could one day be returned to Earth. Join Ken Williford, the deputy project scientist for Mars 2020, for a discussion about the evolving scientific strategy for the mission. The Albert Einstein Distinguished Educator Fellowship is a paid fellowship for K-12 science, mathematics, engineering and technology teachers. Einstein Fellows spend a school year in the Washington, D.C., area serving in a federal agency or on Capitol Hill. Applicants must be U.S. citizens currently employed full time in a U.S. elementary or secondary school or school district. Applicants must have been teaching STEM full time for at least five of the last seven years. Please direct questions about this opportunity to sc.einstein@science.doe.gov. The 2018 RASC-AL Special Edition: Mars Ice Challenge is an engineering design and technology demonstration contest open to full-time undergraduate and graduate students at accredited colleges and universities in the U.S. This challenge gives teams the opportunity to design and build hardware that can extract water from simulated Martian subsurface ice. Up to 10 teams will be chosen to demonstrate their system’s water extraction capabilities in June 2018 at NASA’s Langley Research Center in Hampton, Virginia. Project plans are due Nov. 16, 2017. For more information, visit http://specialedition.rascal.nianet.org. Please direct questions about this opportunity to rascal@nianet.org. This Week’s Question: What Are Sunspots and Solar Flares? The surface of the sun is a very busy place. NASA’s Space Place has a new article about sunspots and solar flares and how they can affect us here on Earth. Looking for more information about the star of our solar system? Check out the Sun: In Depth page for basics about the sun, solar facts and more! On Oct. 28, 2017, events were held around the world to observe the moon. Native Americans have been observing the moon for thousands of years and have developed specific cultural connections related to the moon. Join the ESTEEM team as we explore the Native American perspective of the moon, preview materials, answer science questions, and allow for dialogue. Discover how to bring moon topics to the classroom through the eyes of Native Americans. For more information, visit https://www.nasa.gov/education/esteem/virtual. Questions about this webinar should be directed to Bonnie Murray at bonnie.murray@nasa.gov. This Week’s Question: How Does Mars Compare to Earth? Is a day on Mars longer than a day on Earth? What is gravity like on Mars? Get answers to these questions and more! For the latest news about Mars, visit https://mars.nasa.gov/. Take a walk on Mars in your own living room with Access Mars! This free, immersive experience lets you experience what it would be like to walk alongside the Mars Curiosity rover on the Red Planet. Want more interactive Mars exploration? Check out Mars Trek! This free, web-based application provides high-quality, detailed visualizations allowing astronomers, citizen scientists and students to study the Red Planet’s features. NASA invites the public to send their names to the Red Planet aboard NASA’s InSight Mars lander! InSight will launch in May 2018 and land on Nov. 26, 2018. The mission will do an in-depth study of the interior of Mars to answer key questions about how the solar system’s rocky planets formed, including Earth. InSight will place the first seismometer directly on the surface of Mars and deploy a self-hammering heat probe that will burrow deeper into the ground than any device on the planet has ever done. To get your boarding pass to fly your name on the next mission to Mars, visit https://mars.nasa.gov/syn/insight. Questions about this opportunity should be directed to http://mars.nasa.gov/feedback/. Audience: Children’s Museums, Science Centers, Science Museums, NASA Visitor Centers, Public Planetariums and Observatories Located in the U.S. The National Informal STEM Education Network, or NISE Network, is pleased to offer free “Explore Science: Earth & Space 2018” toolkits to new and existing eligible partners in the United States. In collaboration with NASA, the NISE Network has assembled a new set of engaging, hands-on Earth and space science experiences with connections to science, technology and society. In addition to the physical toolkits, all digital materials will be available online as a free download in February 2018. A total of 250 toolkits will be awarded to eligible organizations through a competitive application process. Eligible organizations include children’s museums, science centers, science museums, public planetariums and observatories, and NASA visitor centers located in the U.S. Applications are due Nov. 1, 2017. To learn more, visit http://www.nisenet.org/blog/post/applications-free-physical-2018-explore-science-earth-space-toolkits-hands-activities-due. Please direct questions about this opportunity to Catherine McCarthy at cmccarthy@smm.org.